Brown boys two-tone shoe in rich brown with dark brown accents. Wee Squeak squeak when children walk heel to toe. The squeakers can be removed for quieter times (silencers included). 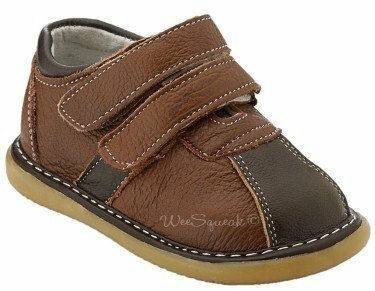 Wee Squeak have a wide toe box, providing a comfortable fit for little feet. Soles are soft and flexible, providing additional comfort. Feature: Material - Leather uppers. Rubber sole. Feature: Shoes should not be worn in a sandbox! Sand could get trapped and prevent squeaker to squeak! !